Steven Slater: The most interesting man in the world? Like 'Balloon Boy' before him, flight attendant is full-blown meme — but for how long? Explainer: Steven Slater: The most interesting man in the world? Steven Slater is … AWESOME! T-shirt or it didn't happen! It's refreshing when someone decides to flourish his way out of a job instead of taking the now-cliché mass-murder suicide route. If former JetBlue flight attendant Steven Slater's literal slide into unemployment inspires other disgruntled workers to find fabulous new ways to quit their jobs sans violence, I'm all for it. Thanks to a plethora of images available via MySpace, Slater's growing nation of followers has plenty to work with — and Know Your Meme had its hands full collecting them for their meme files. "We started an entry on Steven Slater as soon as we saw people start to Photoshop images of him into other existing image memes," says Cheese. "They're pretty hilarious." Scroll down to see just a few of the growing collection archived by the Know Your Meme crew, as well as other assorted Steven Slater phenomena sprouting up on the Internet. "People are using Photoshopped images of Steven Slater to show their respect and admiration for him," Cheese says. "That tends to happen with viral phenomena that start off already in the mainstream." But such spontaneous Photoshop outpourings aren't always a sign of respect. "Remember last year's 'Christian Bale Rant' and 'Balloon Boy?'" Cheese says. "Both of those Internet memes were huge stories in broadcast first. You couldn't turn on a TV without knowing about either of them. This is also probably why both of those memes died out over the course of a weekend. If everybody knows about it, eventually there's nothing else to be learned from it and people move on." Just a few of the growing number of Steven Slater pages on Facebook. 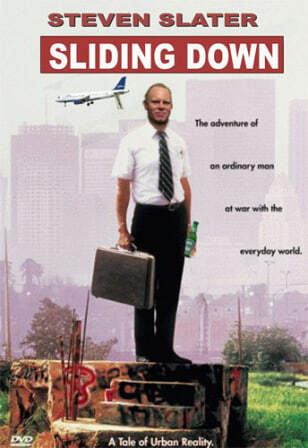 The Steven Slater meme isn't reserved for those with mad Photoshop skillz. "For those less technically inclined, there are Steven Slater fan pages and support groups on Facebook, each with hundreds if not thousands of supporters," Cheese says. "For a story that just went up 24 hours ago, it's kind of incredible." 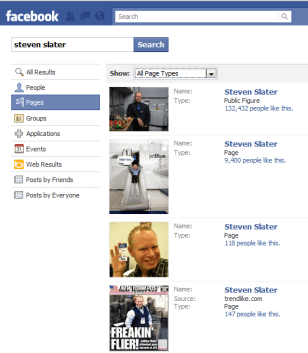 The most popular Steven Slater Facebook page, which updates regularly with news stories and video, has more than 146,000 members. Other fan pages include "What Would Steven Slater Do? (WWSLD? 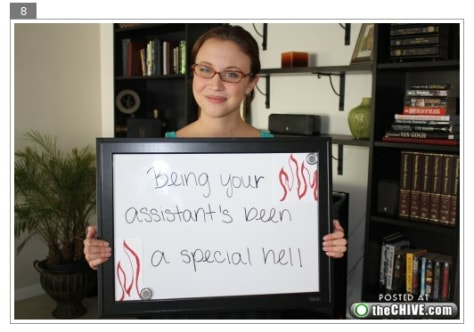 )," a group for "people to discuss stresses of our workplace in a safe environment." There's also the obligatory "Can Steven Slater get more fans than Justin Bieber?" page. On Twitter,#TeamSlater remains a popular hashtag – though it hasn't cracked the top 10 Trending Topics. Trendistic's Twitter Trend chart, part of Know Your Meme's Steven Slater file, shows constant growth since the story broke, with the name spiking to a 15 percent share in Twitter trends around 1 p.m. ET Wednesday – perhaps coinciding with afternoon news or the East Coast’s afternoon tweet time. As delightful and cathartic as Steven Slater remains, the fact is that this man most likely has some serious legal bills in his future — if not a jail sentence. The"Steven Slater Legal Defense Fund," organized by Slater's friends and co-workers, is soliciting donations via PayPal. 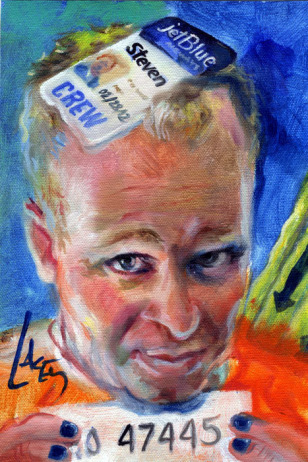 Elsewhere on the Internet, noted artist Dan Lacey is auctioning a Steven Slater portrait (pictured here) to help raise money. There were 20 bids last time we checked, with the price hovering at $355 with eight days left to bid. How else will you remember? How long will this awesome meme last? "Steven Slater might have slightly longer legs (then past memes) as it has the benefit of being a "hero story," says Cheese. "We'll have to see if people are interested enough to come back to see how the story ends." 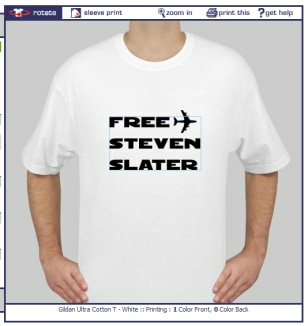 So don't forget to pick up your "Free Steven Slater" commemorative T-shirt that you'll eventually wear while cleaning the oven. Before that inevitability, we should all totally get this one offered by CustomInk.com and wear them the next time we're all on a JetBlue flight together. That would be AWESOME! "There's probably something to be said about the popularity of working-class hero memes online this week," says Cheese, referencing Tuesday’s Dry Erase Girl Hoax. Yeah, you know you fell for it – and there's nothing to be ashamed of. Dry Erase Girl had the hallmark of a well-executed mass hoax; a similar incident surfacing around the same time as a spectacular news story. Remember that time Miley Cyrus and Jeff Goldblum died on Twitter — right around the same time Michael Jackson and Farrah Fawcett passed away for real? Yeah, that's how hoaxes work. As the Steven Slater story continues to unfold, all matter of news media pontificate Slater's place as a recession-era, working-class hero and tut-tut the injuries that didn't —but could have — happened. Still, there may be more … or actually less, to why he resonates. "From what we're reading on discussion boards, a lot of people just find Steven Slater's story amusing," says Cheese. 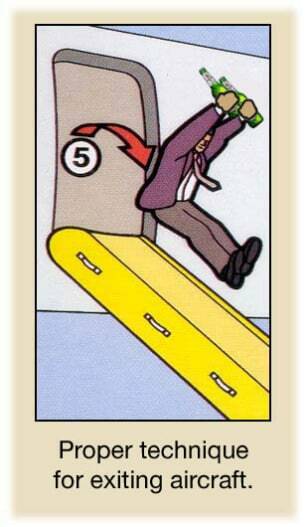 "Visualizing a flight attendant losing their cool, grabbing a couple of beers and riding off into the sunset via the emergency chute is just hilarious." Thanks to Taiwan TV News, visualizing it just got easier. Cell phone video hasn't (yet) surfaced, but TTVN put their SIMs skills to work and, as with Tiger Woods' car accident, Lindsay Lohan's jail time and that one time Justin Bieber had syphillis (not really) turned out this reenactment. All the kids are doin' it! Follow Helen A.S. Popkin on Twitter, or just friend her on Facebook. What are ya, chicken? Ten years ago Tuesday, Mark Zuckerberg launched “The Facebook” from his Harvard dorm. Since then, the site has gone on to redefine our lives online.